Last week, we reported an arribada (arrival) of sorts here at Honokowai. Experts arrived. 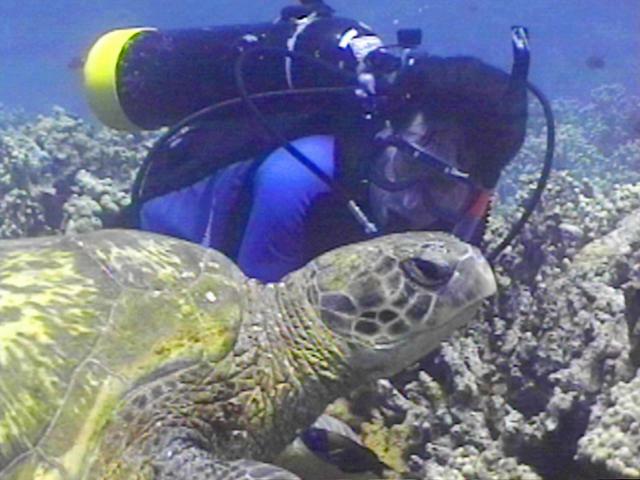 George Balazs and his sea turtle crew spent time with us and met the Honokowai honu. Two turtles, Polzbarney and 1998 Turtle 28, were given up-close-and-personal health checks before again being released into the ocean. Hot on the heels of George's visit came another expert--this one an expert writer. Osha Gray Davidson is author of The Enchanted Braid, a book about coral reefs and the growing threats to these beautiful and fragile resources. He's spending two weeks with us to dive with the Honokowai honu, learning about turtles and fibropapilloma in preparation for his next book. A new diver when he showed up here (just 10 dives under his belt), it took a couple or three "check out" dives before all three of us were confident Osha was ready for the long trek to the Turtle House and back. What stands out most about Osha's underwater conduct with the honu is how readily and easily they have accepted his presence. They allow him to get right up beside them and they placidly watch him watching them. 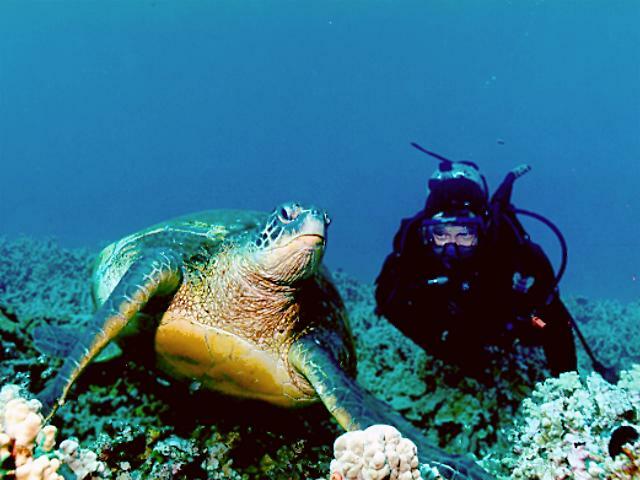 He is excellent at reading their signals and he has a quiet underwater presence that the honu clearly find reassuring. ...he has a quiet underwater presence that the honu clearly find reassuring. Gotcha is a turtle we have known since 1992. Those were the early days before we understood the importance of a name. All honu carry within them Hawaiian names and it only requires careful observation to have each turtle reveal its special name to us. Gotcha got her name because back in 1992 she was very shy and it was difficult to get close enough to her to get a decent photograph. Unless we get a record of a turtle's facial profile (for 100% accurate identification) we can't add a turtle to our logs. After many attempts in 1992, Ursula carefully and slowly sneaked up on this turtle, camera aimed and ready. She finally got close enough and just as the turtle lifted, she saw the honu's facial markings through the viewfinder and pressed the shutter. "Gotcha!" That's how this turtle received her name. Over the years, we've seen Gotcha on almost every dive, and now she allows us to get as close as we want. She is special for many reasons--her size, her beauty--but number one is that she is the only turtle remaining from the Older Times (pre-1994) that is still tumor free. So when George Balazs visited with us last week, Ursula wanted to photograph him beside Gotcha. She'd decided if this splendid turtle would give George a good picture, Gotcha would receive a name change. Gotcha delivered. She is now Ho'oulu. 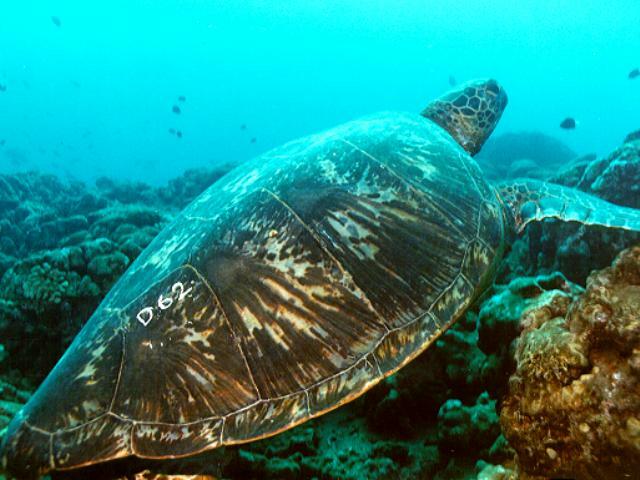 A quick check in a Hawaiian dictionary reveals this as a perfect name for this splendid honu. "Ho'oulu" can mean "to grow, increase, spread" and she sure has spread out since 1992, but ho'oulu also means "possessed/inspired by a spirit" and/or "to stir up, inspire, excite." When she flies in and lands she does that to us each time--she is that beautiful--and that's ho'oulu's last meaning: "to enter in and inspire." It's this last meaning we find the most important, especially in this 25th Anniversary year of the sea turtle tagging programme at the French Frigate Shoals (FFS). The "entering in" is that of George Balazs as he set up camp for the first time at East Island, FFS, and the terrific story there. Ho'olulu's really large but we don't think she's mature yet. It's estimated Hawaiian green sea turtles take about 25 years to mature, so it's quite possible that George sat with her momma in those early 70's FFS days. "To enter in and inspire"--that's what Clothahump, the very first sea turtle we ever met did to our lives back in July of 1988, and that's what every single sea turtle we have laid eyes on does to us. In our Week One summary, we reported that we had advised George Balazs that two of our tagged females were "missing" and requested that he please keep an eye out for them at East Island, the honu's nesting grounds. On the evening of June 29th, we received a message on our answering machine. Mendelbrot, a turtle we have known since 1993, was sighted on East Island laying her eggs. Later in email George reassured us the turtle taggers at the French Frigate Shoals were taking very good care of U 359, Mendelbrot. George is a man of his word. On our morning dive of August 16th, we sighted Mendelbrot for the first time this summer. We recognized her by her facial markings and the lump under her right "armpit", a tumor that continues to regress with each year. Her shell is typical of a turtle who's been out a long time in open ocean--spanking squeaky clean with no hint of algae. The good hearts at FFS also gave Mendelbrot a new "paint job." She has D 62 painted on the right rear portion of her carapace. We have advised George of this sighting, but as yet he hasn't confirmed that D 62 matches the tag number U 359, worn by the Honokowai honu, Mendelbrot. 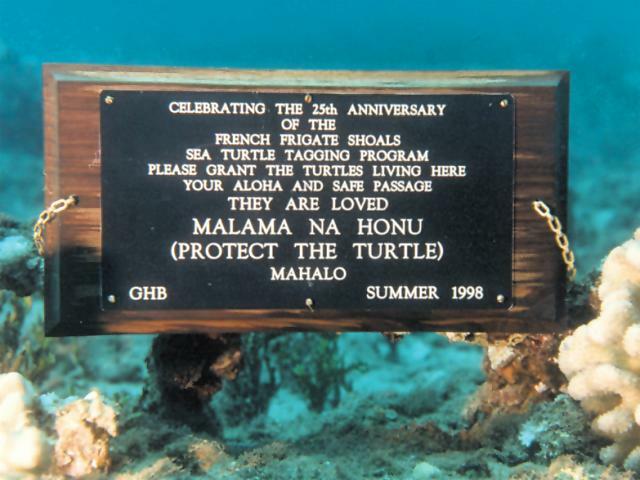 This week, with the help of Osha Gray Davidson, we laid down plaques commemorating the 25th Anniversary of the French Frigate Shoals tagging programme and our 10th summer at the Honokowai Turtle House. We laid down two plaques--one bearing the initials GHB honouring the pioneer researcher of the Hawaiian green sea turtle, and the other marked with N36, honouring the DC3 airplane that first flew him to the French Frigate Shoals on June 1st, 1973. Please grant the turtles living here your aloha and safe passage. They are loved.